Seeing & Believing: Prepping for iCare 2012! Great Shape!’s iCare project offers free eye-care services to the people of Jamaica and serves around 2,000 Jamaicans in rural communities. So…where do all these supplies come from? Well, collecting medication and thousands of eyeglasses is no easy task. It requires huge chunks of time, quite a bit of sweat, and true dedication. This past Saturday, some of Great Shape!’s star volunteers, Steven Stern and Amy Malone loaded pallets of glasses and equipment to be shipped out to Jamaica for iCare 2012. They inventoried, labeled, loaded, and wrapped pallets. The whole process took a total of 5 hours! 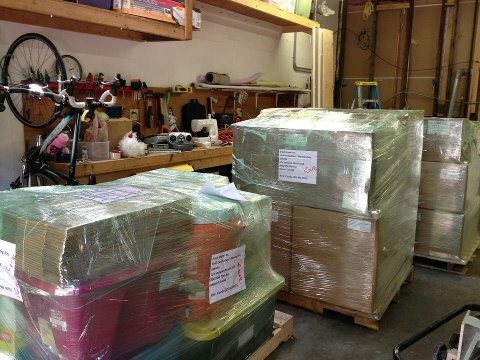 Last year, the iCare team was able to send a slit-lamp and table, as well as an auto-refractor to Jamaica. Slit-lamps are used to look into the eye to examine the retina. Auto-refractors are used to take corneal measurements and give a reading of the patients’ refractive error. We know that 5 hours of packing supplies is tough work! This just shows that our volunteers have a lot of endurance and a lot of heart. Thank you Steven and Amy for all your hard work! Previous post The Monroe Street Pub Crawl Next post SuperKids project makes the Spotlight!